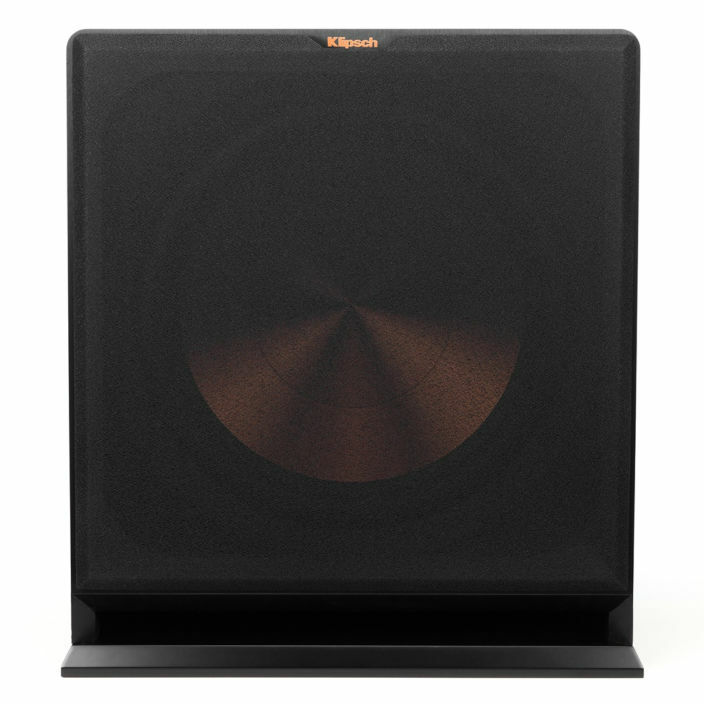 Shake the entire house with the power of Klipsch's R-115SW subwoofer. This subwoofer boasts 800 watts of dynamic power, which is the perfect amount of punchy bass for home theaters and listening to music. With a built-in digital amplifier, it makes the setup and control even easier. Plus, this subwoofer is wireless-optional with the purchase of Klipsch's WA-2 wireless kit. R-115SW subwoofer is the perfect combination of power, sophisticated and heart-pounding bass. Packing a serious punch, The R-115SW features a 15-inch spun-copper Cerametallic driver that is exceptionally light yet extremely rigid - providing remarkably low frequency response with minimal cone breakup and distortion. The front-firing slot port with proprietary internal geometry minimizes port noise for clean undistorted low frequencies. The built-in all-digital amplifier delivers ample power with high efficiency and true-to-source accuracy in reproduction. No music listening or movie watching experience is complete without the deep bass that a subwoofer can give you. A subwoofer can turn your home theater into a movie theater. It turns listening to recorded music into a live experience. The forward facing slot port below the main woofer makes the sub easier to position in your room and also helps brace the cabinet, minimizing turbulence. The result is cleaner, richer sound. The fact that the port is in the front eliminates unwanted “boominess” that can result from sound reverberating off walls and floors. The Klipsch R-115SW will dramatically enhance the overall sound of your home theater system, allowing it to rock harder, and improving depth and spaciousness to make you feel as if you’re in a concert hall or movie theater rather than in your living room or man cave. With its copper colored driver and black cabinet that will blend in with your existing home theater system and speakers, this sub also looks great. The Kilpsch R-115SW has a 15-inch woofer, an amp rated at 800 watts of continuous power, and a price point more affordable than comparable subs in this class. Mediocre subs sound boomy, sloppy and thin. With the Klipsch R-115SW, you’ll hear clean, clear, and more lifelike sound and accurate performance at the lowest levels you’re capable of hearing. Just think of a plane passing overhead before exploding in a pent-up, steroid-infused, big-budget action blockbuster. With the Klipsch sub in your family room or man cave, you’ll hear the high-decibel, low-frequency rumbles, the engine noise of the plane, then the kaboom of the explosion. You’ll be transported to the movie theater. This sub is so powerful that it’ll feel as if you’re right under the plane, on the ground, frantically running for cover to avoid the explosion. This is bass at its best. The rumble, the explosion, and the deep sound become a physical experience. Digital amps allow for direct signal paths that eliminate unwanted noise in the sound that’s coming through. The amp is also more efficient, able to use the full available wattage. The Klipsch Reference R-115SW 15" Subwoofer has a BASH Digital Hybrid built-in amplifier with a high-output of 400 watts for powerful, hard-hitting bass that delivers highly accurate and enhanced sound reproduction. At the low end, sound waves from an explosion in an action movie travel at around 30Hz to 20Hz. A sub should be able to handle a low frequency of 40Hz. The R-115SW frequency response, between 18Hz-125Hz +/-3dB, is expansive. The fact the frequency response tapers off at a window-rattling 18Hz is truly impressive, low enough to appease even the most finicky audiophile. What you get, in essence, is undistorted bass without unwanted rumbling. This sub has a 15 inch spun copper front-firing cerametallic driver (a proprietary mix of ceramic and aluminum), which allows for quick, precise movement for deep, clear bass. The driver is incredibly light in construction yet rigid enough to provide enhanced low frequency response and tight bass reproduction. This type of construction makes it possible to play the subwoofer at loud volumes with minimal cone breakup and distortion for realistic depth. The ceramic-coated aluminum cone, like the driver, is extremely rigid. It also helps to dampen unwanted vibrations, making the bass low in distortion and clean. The sub is front-firing, with the woofers on the sides. This placement pushes the bass waves directly towards you, leading to a better feel of the sound. The design also allows for placement flexibility. Back-panel, low pass crossover and phase control settings allow you to blend the subwoofer’s low-frequency tones with other speakers in your room. They also enable you to get just the right level of bass to your liking. On the rear panel, a DIP switch lets you chose between 120V and 240V. The Klipsch R-115SW is part of the brand’s “Reference” series, groundbreaking high-performance audio products designed with the serious audiophile in mind. The Reference subs also include two other models with smaller woofers, the R-112SW, a 12 inch model, and the R-110SW, a 10 inch model. These subs are light and rigid, with a satin painted MDF plinth and removable cloth woven grilles. They come with spun copper front-firing cerametallic woofers, all-digital amplifiers and are all compatible with the Klipsch WA-2 wireless subwoofer kit for true wireless connection. 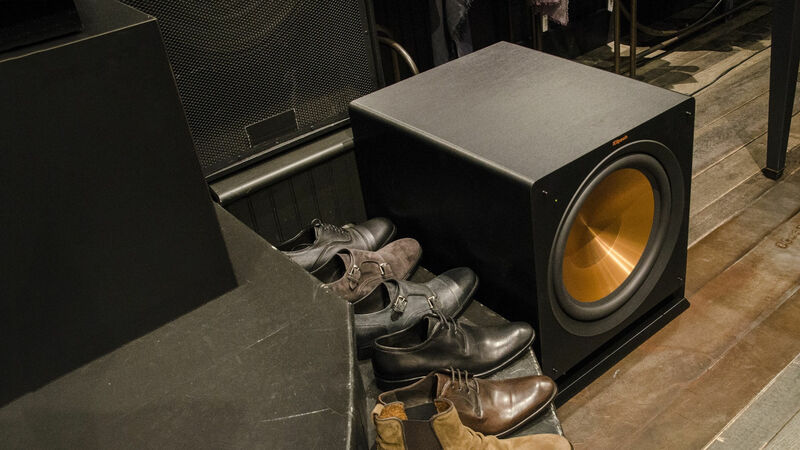 The material of a cabinet has a major effect on a subwoofer’s sound. This cabinet is constructed of thick, durable multi-layered MDF, or multi-density fiberboard, for minimum vibration. The material makes the cabinet a very solid and tight construction. Because the MDF is so dense, sound is kept inside the cabinet and can’t escape. The finish is brushed black polymer veneer and satin painted MDF plinth that will seamlessly blend with your existing system and other speakers.